Here’s another example of how to incorporate both gold star and green star ratings (you can see more examples here). Often, while researching a product to write a review, I’ll come across new information that may change my behavior in some way. In this case, I wasn’t aware of the fact that Converse sneakers can be recycled by returning them to Nike stores. I may also come across alternative products that I wasn’t aware of previously. For example, the French shoe company Veja makes Converse-style shoes (including vegan options) and addresses many of the social and environmental concerns with raw materials and labor. The main materials used in Converse shoes, canvas and rubber, are quite sustainable compared to many of the alternative options. Rubber can either be harvested by tapping rubber trees or synthesized from petroleum. Tapping from trees can be a more sustainable option, but this depends very much on how and where the trees are grown, and also how workers are treated. For example, Veja works with a rubber tapping association in the Chico Mendès reserve in Brazil. They pay tappers a fair wage to harvest rubber from living trees, providing an alternative to cattle-raising and wood extraction, which each take a large toll on the Amazon rainforest. In other cases rubber tree plantations replace native habitat and may not be ideal for local ecosystems. Nike make their rubber from petroleum, so it’s not carbon-neutral like natural rubber, but they did develop a cleaner method for making rubber (via “green chemistry”) and have shared the patents on this process. Earlier this year, Nike, Best Buy, Yahoo!, and a few others launched the GreenXChange, an organization dedicated to sharing patents and ideas that can help companies reduce their environmental impacts. So Nike do deserve some kudos for that, and even though the rubber comes from petroleum, the fact that it’s manufactured in a greener way and, at the end of its life, can be recycled by Nike into track and court surfaces makes me feel better about this option. Let’s take a quick look at some of the other materials used to make shoes. PVC is common in shoes (as well as bags/luggage, clothes, vinyl flooring, and as a stuffing for cuddly toys) and is considered by some to be one of the most environmentally hazardous materials in common use. The EU has studied PVC for decades and Denmark, tired or waiting for legislation, went ahead and banned four of the phthalates used to make PVC. You know something’s probably bad when there are “information councils” set up worldwide to educate people on how safe and wonderful it really is 😉 Briefly, phthalates can act as endocrine disruptors and are associated with breast cancer and reproductive issues such as reduced sperm count in men. Nike committed to eliminating PVC from shoes back in 1998, and have also developed phthalate-free inks for screen printing fabrics. Leather, although considered “natural” by some actually carries a high carbon footprint and involves treatments (usually involving chromium) that are very environmentally destructive. Until 10 minutes ago, I assume that leather was mostly a by-product of the beef industry. This is actually not true – much of our leather comes from India and the story is literally horrific – I feel sick and saddened after reading it. Besides India, most of the leather used in the US and EU comes from China, and the animal sources vary (this story is disturbing too). So… back to Converse. I feel fairly comfortable with the materials involved, but my main concern is with factory conditions. Converse used to be made in the US but they filed for bankruptcy in 2003 and Nike acquired them and moved production overseas. When reviewing a product that’s made by a company that has been taken over by a larger corporation, how much do we consider the activities of the larger company? That depends on your outlook and it’s ultimately up to you. Interestingly when a local Bay Area chocolate company Scharffen Berger sold their operation to the Hershey Company, this was enough to prompt Whole Foods to withdraw Scharffen Berger’s products from their shelves. We do not take the concern over child labor or slave labor lightly, and we are currently in ongoing conversations with Hershey’s about its existing social accountability programs … Whole Foods Market is removing Scharffen Berger chocolate from our shelves pending receiving further information from Hershey’s. Back to Converse – again! In their case ownership by Nike has changed the company in major ways, particularly in moving production from the US to Asia, so there’s no question that evaluation of Converse must also consider Nike’s corporate practices. Here’s a nice presentation on Converse shoes, including some details on how things have changed since Nike took over. This article describes some of the concerns over factory conditions where Converse are made. 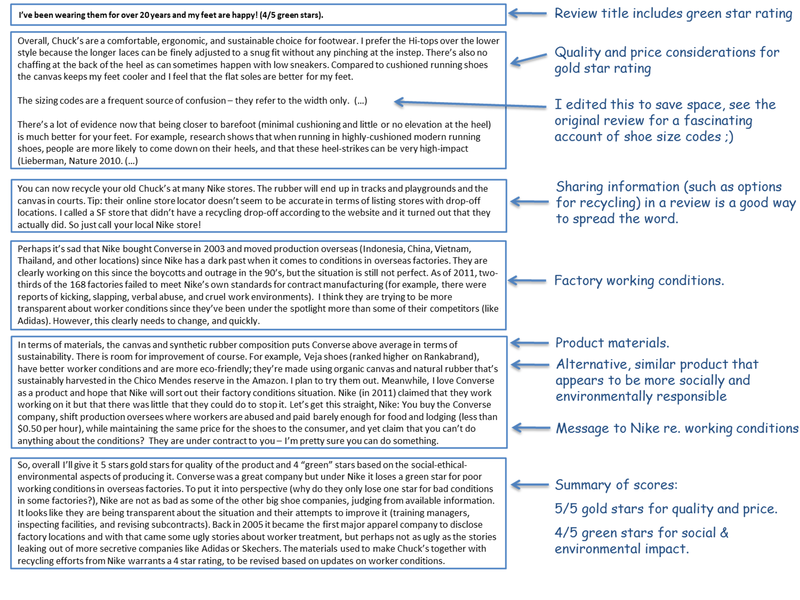 As you can see at the end of the review, I felt that I had to justify a 4 Green Stars rating on Converse considering the poor working conditions reported in some overseas factories. It was a hard decision, but I felt that some perspective was required. 4 out of 5 stars puts the product somewhere between 60th and 80th percentile in terms of social and environmental responsibility (in other words, one step above average, which is 3 stars). They deserve to lose a green star on the basis of working conditions, but my feeling is that Nike is being more transparent than some of the other major shoe companies and are more actively working to improve things. The fact is that a lot of the major shoe and apparel makers have a poor track record (Rankabrand, a useful resource for ranking companies, places Converse ahead of most of the competition). Here’s a thoughtful article on the issue of working conditions in overseas factories, using Nike as a case study. The raw materials are also a big factor in the rating, and although they could be better (i.e., sustainably harvested natural rubber and organic cotton canvas) they are still head and shoulders above some of the alternatives such as PVC and leather. Nike’s shoe recycling program is a significant factor too. You can see the review as posted on Amazon here. Having said all of that, this is all just my opinion. Please weigh in and write a review of any shoes that you own and perhaps plan to buy again – what you learn in the process may change your future purchase decisions. Really interesting. I’d like to think a lot more about ethical consumerism (if there really is such a thing!) this year. Thank you 🙂 Let us know how you get on! Thanks for the heads up on recycling. I love my converse so much and was happy to hear that they are on the road to getting better. Hopefully Nike is ready to make real changes. No reason why they can’t influence local factory owners. I agree. It all comes down to consumer awareness and demand. Veja have set a higher standard now so it’ll be interesting to see if Nike follow. Esp after Emma Watson wearing Veja and bringing them lots of attention. I just love that Emma Watson.